Designers nod to the natural world in the form of warm-toned materials, details pulled from the atmosphere, and patterns that go with the grain. 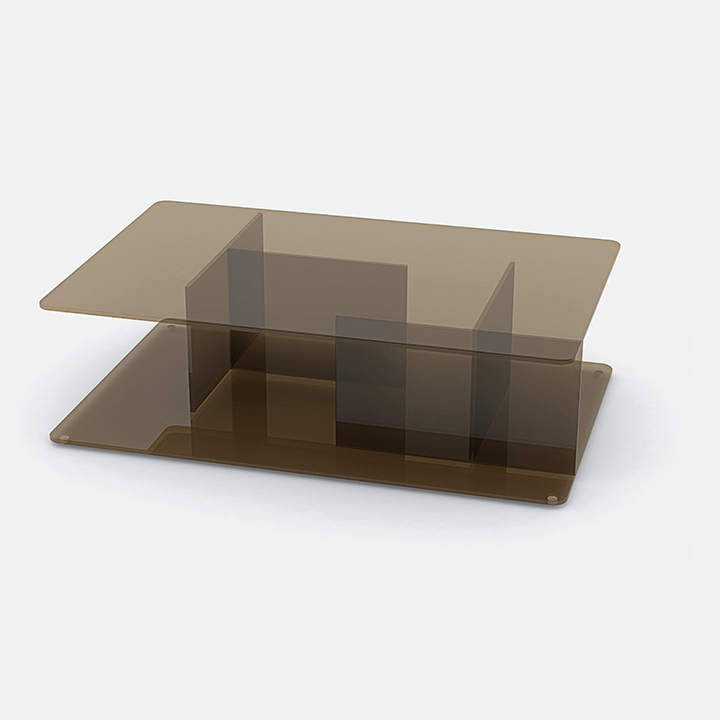 Lucent coffee table by Matthew Hilton for Case. Bronze glass panels joined at right angles create cubbies for storing books and magazines. Derome light by Russell Pinch. Standing just over three feet tall, British designer Russell Pinch’s table lamp has an ultra-thin ash veneer shade. When illuminated, the natural wood grain becomes visible. Pushpin stool by Kenyon Yeh for Esaila. Taiwanese designer Kenyon Yeh takes the shape of a pushpin and increases its size exponentially for his cork combination stool and end table. Element Vessel Terra-Cotta by Vitamin. Made in the United Kingdom from slip-cast terra-cotta, oak, and cork, the Element Vessel works as a vase, decanter, or sculptural object. LW73A by New Moon. Hand-knotted in Nepal, the vegetable-dyed wool rug translates traditional Navajo flat-weave designs into a plush form. Ahnda chair by Stephen Burks for Dedon. Latticed red, orange, and brown textile cord make up the sides and back of the indoor-outdoor lounge chair. Fog by Front for Zero. The gradient on this glass pendant by the Swedish studio Front transitions from opaque on the bottom to clear up top, creating a cloudy look. Majordome tables by Cédric Ragot for Roche Bobois. A chromed-steel frame finished in brass or gold supports walnut-veneered MDF tops. Available in four different bases, including the Pied X Double Plateau. PS 2014 corner cabinet by Keiji Ashizawa for Ikea. For its PS 2014 line, Ikea collaborated with international designers to create furniture targeted to renters, including this triangular cabinet built to tuck into underutilized corner spaces.